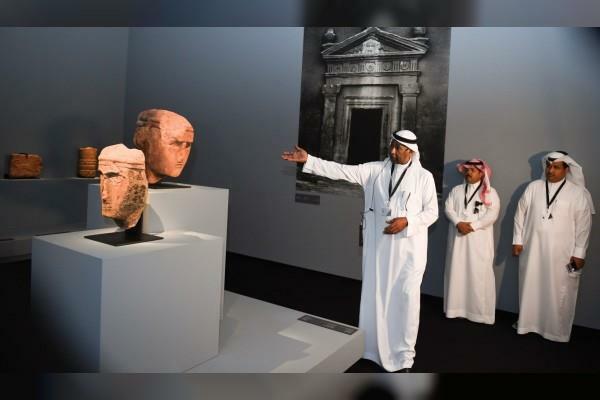 ABU DHABI 7th November, 2018 (WAM) -- Louvre Abu Dhabi organised a tour for media professionals at the "Roads of Arabia: Archaeological Treasures of Saudi Arabia," the second international exhibition of the museum's cultural season.The exhibition isbeing held at the Louvre Abu Dhabi as part of exchange activities between the UAE and Saudi Arabia, which enjoy a close relationship and share a common historic background. The exhibitioncoincides with Louvre Abu Dhabi's celebration of its first-year anniversary. Speaking to the Emirates News Agency (WAM), Dr. Jamal Omar, Vice President of Antiquities and Museums at the Saudi Commission for Tourism and National Heritage(SCTH), said the exhibition explores the rich history of the Arabian Peninsula through archaeological and cultural artefacts, including a selection of rare pieces from the United Arab Emirates, underlining the inseparable ties between the Emirati and Saudi societies across all ages. Featuringmore than 460 artefacts from the National Museum in Riyadh and a number of other Saudi museums, the exhibition highlights the Kingdom's global presence and its Islamic position as home of the two Holy Mosques, as well as its economic role and impact on human relations, as a unique geographic hub that constituted a cultural and economic bridge between East and West.